In this example we will be creating a new Salesforce form that will allow us to capture multiple child object records related to an existing account record in Salesforce that will be retrieved using a lookup field. Rename your form, we will use "Annual Survey". Add at least one page to your form. We will add one called "Funding Details" and click the "+" button to create it. 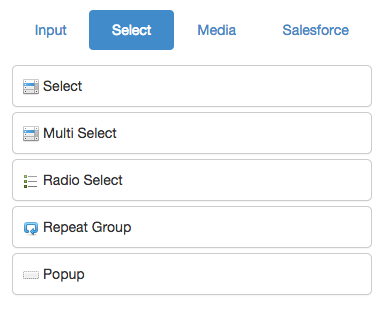 Drag and drop a Salesforce Lookup field on your form. We will use the lookup to attach the form to an existing Account. Click the pencil icon to edit the Salesforce lookup field. Select an object you would like to use for the lookup, this will allow you to search for any record under this object. In our case we will name the Label as "StartUp Company" and will link it to the Account object. Next we will add a Repeat Group element that will allow us to create any number of records. Click on the Repeat Group pencil icon to edit the Repeat Group label. Change the label, we will rename the label to "Funding", this will be used when adding new items to the Repeat Group, for example "Add Funding". Now drag and drop fields into the repeat group field. We will use "Text" field and rename it to "Funder", a "Date" field and rename it to "Award Date" and a "#Number" field and rename it to "Award Amount". Now we will need to create a Salesforce connection. This will be used to attach the form to a custom object in Salesforce. Click "Add" under the connection column. Select the Salesforce object you would like to link this form to and click "Save". We will link the form to a custom object "Funding". In the "Use Repeat Group" list select "Funding", this is the Repeat Group we created earlier on the Formyoula form builder. Click "Save" when selected. This will ensure that the connection is repeated as many times as there are fundings added to the form entry and creates all necessary records in Salesforce. Next we will need to map our Formyoula fields to the Salesforce "Funding" object fields. First we will map the account lookup field that we named "StartUp Company" to an "Account" master detail relationship field that links the funding child record to an account record. Now please map all the other Formyoula fields to the Salesforce "Funding" object fields. Check if the mappings are correct and go back to the Formyoula dashboard when done. Fill in the form. Use the Salesforce lookup to find the existing "Account" in Salesforce. Fill in the rest of the form and create as many "Fundings" as you need by clicking "Add Funding" and then "Add" to create a new entry. Now when you open Salesforce you will be able to see the new "Funding" entries. Also you will be able to see the "Funding" entries under the selected "Account" using the Salesforce lookup while capturing the form entry.